The Order of the Visitation Sisters was founded in 1610 by Saint Francis of Sales and Saint Jane Frances de Chantal. 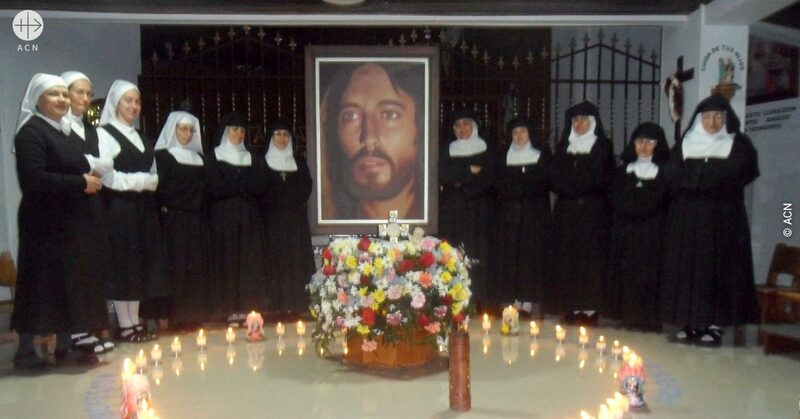 Also known as the Salesian Sisters, they live a contemplative life of prayer in enclosure. At the same time, however, many are also involved in spiritual accompaniment and education. The name of the order is taken from the Visitation of Our Blessed Lady to her cousin Elizabeth in Saint Luke‘s Gospel (Lk 1:39-56), when Elizabeth greeted Mary as „blessed among women“ and Mary responded with the Magnificat. The emblem of the order is the pierced Heart of Jesus, surrounded by the Crown of Thorns. One of the best-known saints of the order was Saint Margaret Mary Alacoque who, in the 17th century in a series of visions in her convent in Paray-le-Monial in France, was urged by Christ himself to promote and spread devotion to his most Sacred Heart, in reparation for the cold-heartedness and ingratitude shown by so many people towards their Redeemer. In the visions Jesus expressed his great sorrow and suffering at the fact that so many people are utterly indifferent to the great love he has shown in dying for them on the Cross and allowing his Sacred Heart to be pierced through for their sake. Devotion to the Sacred Heart of Jesus is the appropriate response to this infinite love. Both the Feast of the Sacred Heart of Jesus and the First Friday devotions to the Sacred Heart take their origin from these revelations and are now firmly established in the Universal Catholic Church. Altogether, the Order of the Visitation Sisters has some 2,500 religious sisters, spread across over 150 different convents in four of the five continents. The Visitation convent in Malaga, in Colombia, has recently gained two young aspirants after many years without any new vocations. They now have 10 sisters altogether, seven of them professed sisters who have taken their permanent vows. They write: „By our contemplative lifestyle, in accordance with the Rule of the Order, we offer up to God each day our prayer, our humble service, joyful reparation and sisterly life together as a living prayer for the world and the Holy Church. We strive to constantly advance the formation of the community and of each individual sister, so that our prayer and our spiritual life may become better. We share the times of recreation and rest in the joy of being together and responding together to the call of God. The sisters produce candles as a means of supporting their modest lifestyle. But their income from this is not sufficient to provide the sisters even with the basic necessities such as medical care and their daily needs. And so they have turned to ACN. We are proposing to help them once again this year as we have in the past, and so we have promised them 3,500 Euros.